LYNLY MANOR is located on the beautiful west coast of Barbados between Speightstown (1.5 miles) and Holetown (6 miles). The Manor consists of a main house and two connecting luxury apartments. We are a short (300 yards) or 5 minute walk from the world-renowned Mullins Beach. Come and relax in one of our 2 bedroom apartments . Enjoy the front and rear patios that capture the soft trade winds from the Caribbean and look out upon a quiet pastoral setting. The apartments are modern, airy and bright. Want to pamper yourself? Contact the wonderful Indulgence spa (also within walking distance) which offers a full compliment of spa services as well as a full service gym. Are water sports your thing? Mullins beach offers multiple water activities including jet skiing, parasailing and diving. Or, just relax and enjoy one of the worlds most beautiful beaches. Bring plenty of sun screen. Enjoy fine dining? Barbados is known for its many restaurants and food establishments that will suit any taste or pocket. Make sure you try the flying fish. Airport pick up and car rental can be arranged for reasonable rates. Lynly Manor has no required check in/check out times as we try to accommodate the varying schedules of our guests. There is a 24 hour mini-mart, also within walking distance, that sells most items for your basic needs. Full service supermarkets are located in Speightstown and Holetown. Both locations have banks, restaurants, internet services and shopping areas. The public library in Speightstown offers free internet services. The Manor is near a major transportation route. There are buses and minivans that pass every 5-10 minutes from 5AM to midnight. Come sit back, relax and enjoy your vacation the Bajan way!! The apartment is eqipped with its own washer. The apartment is eqipped with its own dryer. Wireless internet is provided. Guests must bring their own devices. Each apartment is equipped with bath towels and washcloths. Guests must bring their own beach towels. Each living room can accommodate 4. Each has it's own flat screen cable TV, DVD, and stereo. Service for 4 as well as extra cooking plates and utensils. There is a separate dining room as well as 2 stools for kitchen counter. Cable TV with channels suitable for adults as well as children. Multiple books are in each apartment. Bring one and take one. (2) The front balcony accommodates a small table for dining. Screened windows. The living room, dining room and both bedrooms have ceiling fans. An iron and ironing board are on site. Lovely place to stay & fabulous location!!! Accommodation as described as per the photos. Lovely and clean, well equipped, TV channels were brilliant for watching sport. Only a Few minutes walk to the famous Mullins beach, also to the garage and a great place to eat called Bombas. We will definitely be returning to stay here! Location and apartment just perfect. The apartment was fully equipped and perfect for us. Close to the beach and the gas station. We always drive when in barbados and the location on the west cost is quiet and still convenient for speightstown and holetown. On our last day we had car trouble and the lovely owners offered to drive us to the airport if we needed. We will definitley stay again. Thanks Lynly Manor we enjoyed our stay very much. Nicole was a lovely guest and it was a pleasure hosting her. We have tried to maintain the apartments and keep them up to date. When we are in Barbados, we look to accommodate our guests anyway we can. We enjoyed our stay at this apartment very much. Ceiling fans in several rooms plus A/C in the bedrooms made it very comfortable on hot evenings and nights. We arrived late in the evening but our gracious, friendly hosts were there to greet us and help us get settled. The house is in a very quiet neighbourhood and a short walk to Mullins beach and Beach Bar. It is close to the bus route but we had a rental car, which was great for exploring the island. We could choose from two outdoor sitting areas so that we could always be comfortable out of the strong sun and heat. The apartment could use a few more dishes, cutlery and cooking utensils so that the dishwasher wouldn't have to be used so often. We had a problem with the bathroom light not working but it was fixed very quickly. Lynn and Lyle couldn't have been better hosts, so kind, friendly and interesting to talk to. Howard and Valerie were great guests and would be welcome back at anytime. It was a pleasure hosting them. We try very hard to make our guests welcome because more than anything we want them to have a great time....both in Barbados and at Lynly Manor. The apartment was comfortable, clean and simply furnished for basic cooking. Our hosts were fabulous - welcoming, helpful, responsive to small emergencies - and knowledgable about the island both before our visit by email and during our time in Barbados. Area was very quiet and so convenient to the beach at Mullins Bay. Highly recommend! Linda was a fantastic guest and it was a pleasure having her. We are happy she enjoyed both the island and the apartment. She would certainly be welcomed back should she decide to return to Barbados. My husband and myself have just spent one month at Lynly Manor. 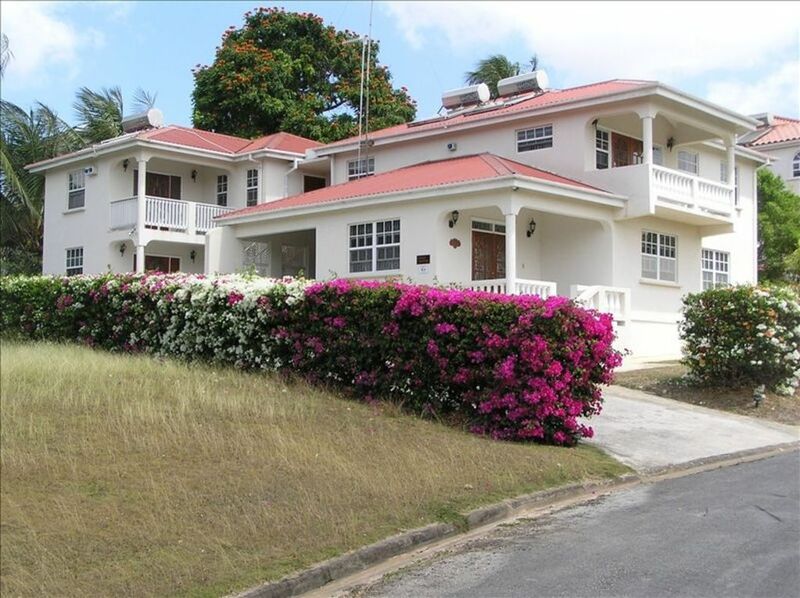 The location is ideal and so peaceful yet just a short walk to Mullins beach and the bus stop. Where you can easily get to the North or South of the Island for just 2 Barbadian dollars. The apartment is spacious and has all the conveniences for a self catering holiday. There is a small patio to the front for al fresco dining. From the beginning it was a pleasure working with Joanna for her vacation at Lynly Manor. From her initial inquiry to the final countdown her questions were good and thoughtful. We are glad that she found the apartment convenient and with useful amenities. We try to make sure the apartment is kept up as has been shown by the positive reviews over so many years. We recently spent a month at Lynly Manor in the second floor apartment. The apartment is clean, comfortable, well furnished, the kitchen is well equipped, windows and doors are screened and security is excellent. We liked the area, visits from the green monkeys, birds in the garden and fire flies at night. It's a short walk down the hill to Mullins Beach where the water is calm and good for swimming. Mullins Beach Bar has food, cold drinks and rental chairs and umbrellas are available for the day. It's a perfect place to watch the sunset. Speightstown and Holetown are close by and have large supermarkets, banks, restaurants, shops, etc. A convenience store that stocks basics is a short walk from the Manor, at the Rubis Gas Station. We got around by bus. Service is frequent and efficient for $2.00 a trip. The owners, Lynn and Lyle were in residence while we were there and they are very friendly and helpful. We highly recommend this property to anyone looking to visit Beautiful Barbados. Thank you for this wonderful review. We try very hard to ensure that our guests feel comfortable in their surroundings. We look forward to providing these services to anyone who wishes to stay at Lynly Manor. Visit the Wildlife Preserve where animals roam free. At 2 PM they feed the animals and the green monkeys come too. Call Tiami Catamaran Cruises for a lovely day of sightseeing. Swim with the turtles and have a great lunch. Go for a walking tour of Bridgetown (the capitol) and see the UNESCO heritage sights. Visit Harrison's Caves for an overview of the 'birth' of Barbados (the only non-volcanic Caribbean island) and see the caves with the beautiful stalagmites and stalactites. Visit several beautiful beaches, each of them unique. Cancellation policy: 90 days full refund. 60 days half refund. 30 days no refund. Please adhere to maximum of 4 guests.